What with swimming, gymnastics, more swimming, piano, jump-rope early in the mornings and a zillion other social engagements, I feel drained at the end of each day. It's tough to do it alone. I tip my hat to the single moms out there. I am physically exhausted and ready to throw in the towel after a week and a half! But I have to make it through another 3 weeks. It helps to be part of a cooking co-op. It takes a lot of pressure off trying to figure out what dinner should be. Yes, I'm trying out a cooking co-op that 4 families in my neighborhood have been participating in for the last 7-8 years at least. They each cook 4 meals by the end of each month and exchange containers of frozen delights with the other families. Each family ends up with 12 different entrées, and 4 of their own, which help jumpstart the meals on busy weekdays. Dishes can be soups, sandwiches, burritos, pasta sauces, anything that will freeze well. It works well for me because I cook in large quantities anyway and freeze meal-size portions to pull out on busy weekdays. But we end up eating the same thing too many times. This way, I cook the same amount except that I get a lot of variety in return. It's really quite exciting! 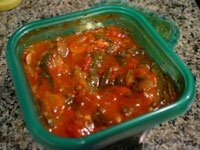 So far I have got excellent chicken burritos, an eggplant sandwich to die for, navy bean soup that is in the freezer and a delicious veggie pasta sauce with mushrooms, red peppers and spinach (see picture). 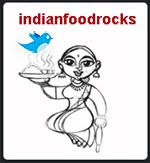 My contributions have been fish curry, shrimp pulao, pav bhaji and saag paneer. Luckily for me, they love Indian food! 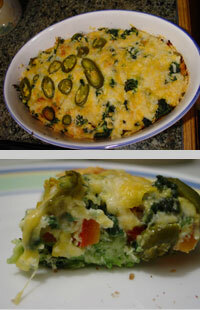 Then again there are days when I long for my own cooking despite the hustle-bustle and sometimes a simple one-dish meal like a Veggie Egg Bake is the answer! This dish is so easy to put together. You can switch the broccoli and spinach for other veggies you may have. It takes only about as long to put together as the oven takes to heat up to 400F. Yup! Just 10 minutes prep time and then go do whatever you need to for the next half hour. How easy is that?! If you're wondering why only half the dish has the jalapenos, well, my daughter is not quite ready for the heat that generates! When the phone rings at 4 a.m., you know it has to be bad news. Yet you hope against hope that it is a wrong number or somebody calculated the time difference incorrectly. No such luck this Sunday. My father-in-law passed away suddenly on Sunday, one day after Sankranti. 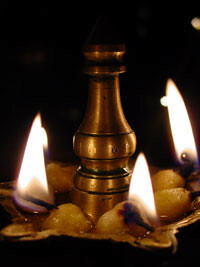 I lit this diya earlier on my blog for the New Year. Today I light it for him. It may seem very inappropriate to share a recipe at such a time. But yet I think it isn't. I learnt it from him. Karela, thin and crisp. He believed that every part of a plant has some nutritional value and that skins, peels, seeds (soft) should not be discarded. Therefore the karela is not soaked in salt water and then squeezed to reduce its bitter taste. We had a rocky start to 2006. We woke up to find two dead fish. My 7 year old daughter discovered them and she was very very upset. Some of you may be familiar with Elizabeth but poor Coco never got a proper introduction. Just this, an eulogy. He was inducted into the clan as a companion to Elizabeth. After some initial pecking, the two goldfish seemed to enjoy each other's company. They even frolicked in the bubbles that the filter generated. We think that it was a bacterial infection that caused this but we're not really sure. I am getting excellent advice at Another Subcontinent, a forum that has become one of my favorite haunts. It's also an amazing resource on everything Indian and South Asian. From food to literature to music to language to cultural biases and eccentricities. When things go so badly wrong at the beginning of the year, I feel that it can only get better from that point. I am quite optimistic that it will work this way. With that, I wish you all the very best in the year 2006. I hope each one of us finds the calm and peace we seek as well as the inner strength to work through the tribulations and hurdles that we may find strewn along the path to this goal.